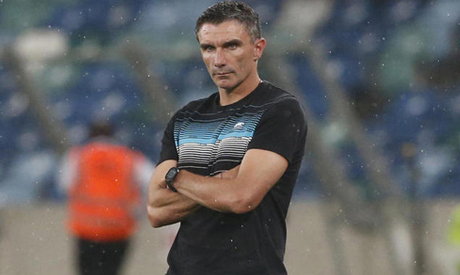 Ahly coach Patrice Carteron said on Monday he is very sad after a security decision to limit attendance for the club's members in Tuesday's anticipated clash against ES Setif in the champions League semifinal. Ahly initially received permission from Egyptian security to host 10,000 people at El-Salam Stadium. However the Egyptian Football Association (EFA) informed the club on Monday that authorities decided that attendance will be restricted to club's members at 8.500. The Cairo giants will host the Algerian side in the first leg of the Champions League semifinals at El-Salam Stadium in Cairo, while the second leg will take place on 23 October in Algeria. "I am so sad with this decision," Carteron said in the pre-match news conference on Monday. "I played around 30 games in the African competition and if the fans were banned due to their chants in each game, we would not see them in the stands any more,'' the former Mali and TP Mazembe coach was quoted as saying by the club's official website..
"We respect all decisions and we will play the game," the coach concluded. Ahly have been hit with a two-match fan ban (currently on hold) and fined ($20,000) by the Confederation of African Football (CAF) following their fans unsporting and offensive behavior during Ahly's 4-0 win over Horoya of Guinea in a Champions League game in Cairo. The eight-time African champions are bidding for their first Champions League title since 2013.